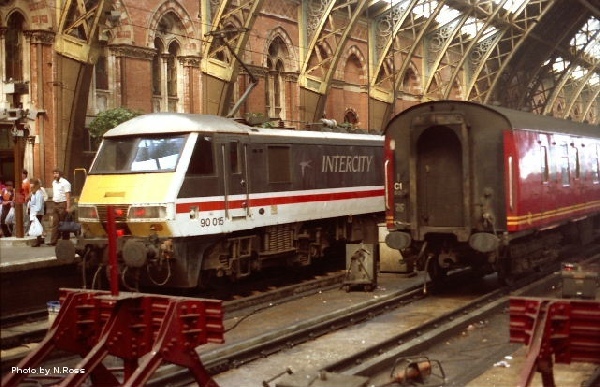 This loco started her career in late the 1980s on the West Coast for Intercity and latterly Virgin Trains. The 90 worked the first ever passenger train which happened on the 12th July 1988 having travelled from Preston to Euston via the West Midlands following the failure of the booked class 86. On a very cold winter’s morning, 90003 in the former NXEA livery pauses at Ingatestone due to planned engineering work by Network Rail. The 90 was working an express train from Norwich to Shenfield. This is a shot of 90003 slowing down for the approach to Colchester station on the up line with a service train from Norwich bound for London Liverpool Street. Class 90s lead services heading towards London. The nameplate of 90003 at the time this was picture was taken was “Raedwald of East Anglia”. Interestingly since this photo was taken the colourscheme for the nameplate has gone from being blue to red. On the 12 July 2012 the class 90s entered their 24 year of passenger operations and the birthday engine was captured with a DRS class 37 on her return from Crewe to Crown Point following a planned overhaul. Looking rather clean and ex-works sporting the freshly painted NXEA house colours, 90003 stands at London Liverpool Street after arriving with a train from Norwich. The 90 then went back to East Anglia.